The reaction of the SNP and their pro-independence outriders to the latest Government Expenditure and Revenue Scotland (GERS) figures has laid bare the astonishing paucity of their economic arguments. Unable to answer the obvious problems that the GERS figures highlight for those championing the break-up of the UK, they’ve resorted to trying to discredit their own figures. 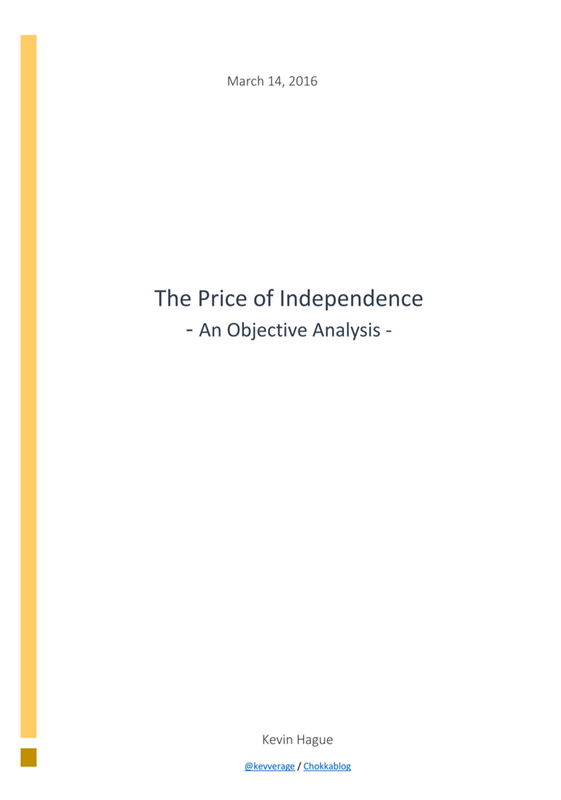 In case anybody’s forgotten: these are the figures on which they based their case for Independence, figures their own White Paper described as “a useful indication of the relative strength of Scotland’s public finances as part of the UK and a starting point for discussions of Scotland’s fiscal position following independence”. Now it seems the SNP want to deny this starting point. Having once proudly boasted that they had Nobel Laureates championing their cause, the SNP now appear reduced to relying on the increasingly embarrassing contributions of accountant and tax specialist Professor Richard Murphy. We should be more interested in what Murphy says than who he is, but given his penchant for self-aggrandisement it’s worth noting that he’s the man who was unceremoniously dumped as an advisor to Jeremy Corbyn’s Labour Party. John McDonnell publicly stated that Murphy “leaves a lot to be desired on macroeconomic policy”, to which he responded by suggesting that the Shadow Chancellor – a self-confessed fan of Karl Marx’s Das Kapital - was “all too willing to accept conventional neoliberal thinking”. Let’s be kind and just say that nobody can accuse Murphy of being guilty of conventional thinking. Politically homeless, Murphy seems to have cast his eyes north and spotted a pro-independence movement bereft of ideas and desperate to find ways to distract from the simple facts shown in GERS. 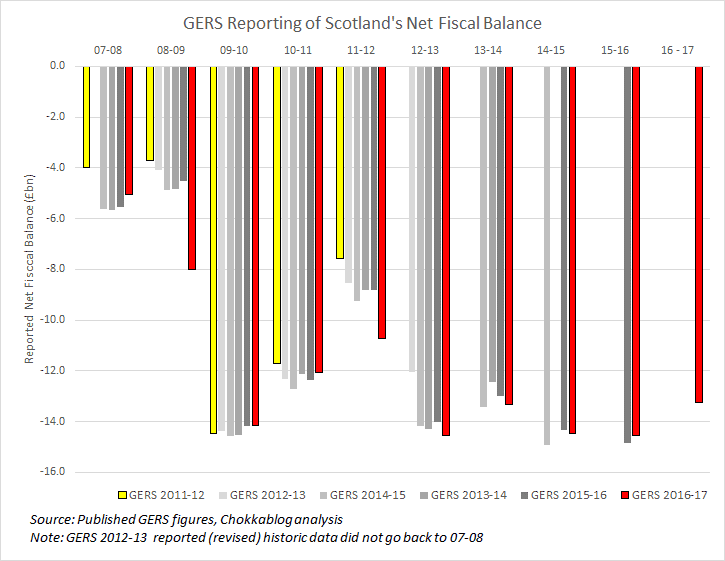 GERS shows that the UK’s deficit is running at just 2.4% of GDP and, because Scotland voted No in 2014, that relatively healthy fiscal context determines Scotland’s ability to continue to sustain spending on vital public services. By contrast, following the collapse in North Sea oil revenues, Scotland’s notional stand-alone deficit is 8.3%. The EU’s “excessive deficit” threshold is 3.0%, so even before considering the challenges of creating a currency and weathering the shock of separation from the UK single-market – a market objectively four times more important to Scotland than the EU - it’s clear that an independent Scotland wouldn’t be able to sustain the tax and spend levels described in GERS. So economic facts have become the SNP’s enemy. Cue Professor Murphy, a man willing to say what desperate people want to hear if it gets him in the limelight. With the gay abandon of somebody unburdened by understanding, he’s set about casting aspersions on the Scottish Government Statisticians who compile the GERS figures and all those who use them. He’s bumptiously asserted that the figures are “untrustworthy”, “rigged by Westminster”, “literally made up” and “nonsense”. Incredibly he’s even suggested that those using the GERS methodology are “risking the allegation of professional misconduct”. So that includes not only the Scottish Government’s Chief Economic Adviser’s team in St Andrews House and the ONS (who qualify the report as National Statistics), but presumably also those Nobel Laureats who relied on GERS when they sat on the SNP’s Fiscal Commission Working Group. Surely only the most desperate politician would lean on Professor Murphy’s transparently misguided proclamations for support? Well it turns out there are quite a few desperate nationalist politicians. SNP MP Mhairi Black used a recent newspaper column to cite Professor Murphy as reason to dismiss her own government’s figures. A quick search of Twitter shows his blog rants have been promoted by SNP MSPs and MP’s including Joan McAlpine, Peter Grant, Chris Law, Gordon MacDonald, Christina McElvie and Richard Lyle1 . If any of these politicians had bothered to dig past Murphy’s bluster, they’d see that his ill-informed opinions are based on a combination of technical misunderstandings, an inability to grasp the simple concept of materiality and his own failure to get his head around the figures. There isn’t room here to indulge in the minutiae of Murphy’s technical points2. Suffice to say he’s like somebody looking at a report into the Titanic disaster and complaining there isn’t enough information about the deck-chairs. We might not know precisely how the deck-chairs were arranged, but that’s just not a material issue. Murphy’s wider argument is basically one of incredulity: he simply refuses to believe the GERS figures can be correct because he doesn’t understand them. He casually advertises his ignorance of how the figures are compiled by admitting to being “continually bemused” because he thinks the numbers are somehow “improbable”. For those who’ve taken the time to study the GERS figures and the methodology behind them, there’s nothing bemusing or improbable about what they show. Scotland’s per capita deficit is much larger than the rest of the UK’s mainly because of higher spending. Despite GERS-deniers’ determined attempts to obfuscate and misdirect, Scotland’s higher per capita spending has nothing to do with estimates or allocations. Nobody credibly disputes that we spend over £1,500 per person more on comparable public services in Scotland, a fact fully explained by the known actual figures in the table on this page3. There isn’t necessarily anything inherently unfair about this either. Scotland has geographic, demographic and socio-economic characteristics which mean greater per capita spend is required to deliver equivalent services. Whatever the likes of Murphy may claim, there’s nothing bemusing or improbable about the relative scale of Scotland’s deficit. The pro-independence camp likes to suggest that the GERS figures show Scotland failing under the yoke of Westminster rule. In fact they show UK-wide sharing of resources allowing greater spending on public services in areas with greater economic need; only the most narrow-minded nationalist could see that as a failure. Last week the Scottish Government published their annual Government Expenditure and Revenue Scotland (GERS) report. The figures were good news for those Scots who believe in the value of pooling and sharing resources across the UK, bad news for those who believe Scotland should be independent (or for some reason needs to be fiscally autonomous). The UK’s deficit is running at 2.4% of GDP and, because Scotland voted No in 2014, that fiscal context determines Scotland’s ability to continue to sustain spending on vital public services. By contrast, Scotland’s notional stand-alone deficit according to GERS is 8.4%. The EU’s “excessive deficit” threshold is 3.0%. Even before considering the challenges of creating a currency and weathering the shock of separation from the UK single-market – a market objectively four times more important to Scotland than the EU - it’s clear that an independent Scotland wouldn’t be able to sustain the tax and spend levels described in GERS. The SNP’s Independence White Paper predicted that this year under current constitutional arrangements Scotland’s deficit would be 1.6 – 3.2% of GDP. This means that their starting point, the base on which they attempted to build their economic case, was out by £8.1 - £10.7 billion a year. The main reason for this shortfall is that the SNP famously used recklessly optimistic oil revenue forecasts of £6.8 – 7.9 billion for 2016-17. The actual figure has turned out to be just £200 million. The reaction of the SNP and their pro-independence outriders to last week’s completely unsurprising figures laid bare the astonishing paucity of their economic arguments. The SNP once proudly proclaimed that they had Nobel Laureates championing their cause. Now they’re reduced to relying on the increasingly embarrassing contributions of accountant and tax specialist Professor Richard Murphy, the man who suggested that John McDonnell was “all too willing to accept conventional neoliberal thinking”. Murphy’s argument is basically one of incredulity: he simply refuses to believe the GERS figures can be correct because he doesn’t understand them. He casually advertises his ignorance of how the figures are compiled by admitting to being “continually bemused” because he thinks the numbers are somehow “improbable”. The graph on this page illustrates the simple truth that the perpetually befuddled Professor Murphy seems unable to grasp. 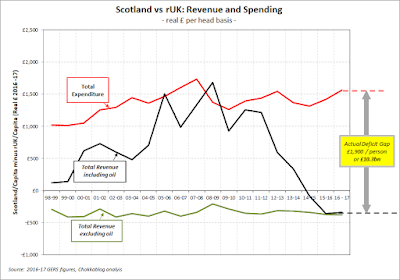 The three lines show 19 years of relative spending and revenue per capita for Scotland versus the rest of the UK (rUK). The picture is clear: Scotland’s per capita deficit is much larger than the rest of the UK’s mainly because of higher spending. When oil was booming, Scotland’s revenues were sometimes enough to largely offset that higher spend, but as oil revenues have declined the underlying onshore deficit gap has been exposed. 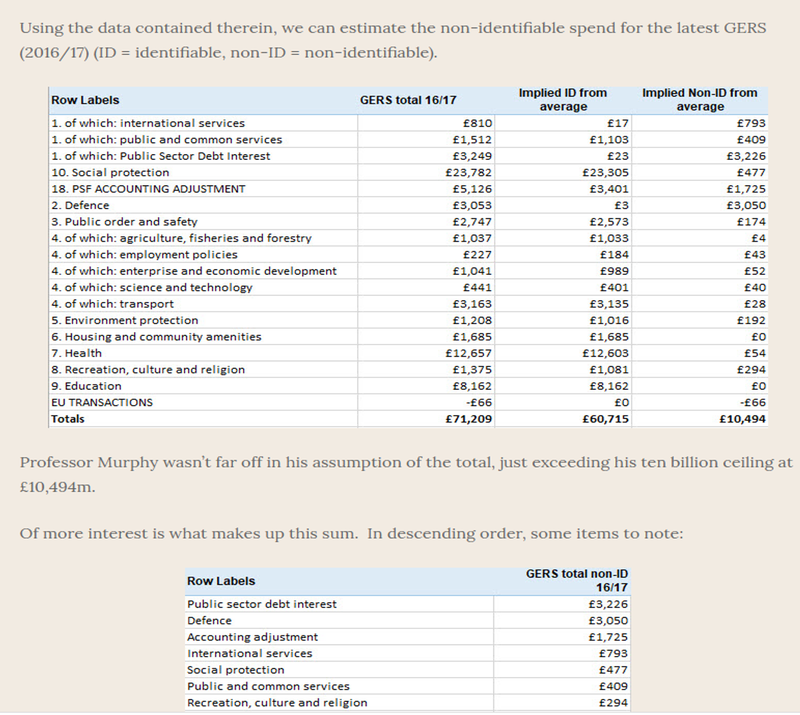 Professor Murphy attempts to obfuscate and misdirect on this point, but the per capita spending difference shown by GERS has nothing to do with estimates or allocations, it is fully explained by known actual figures. 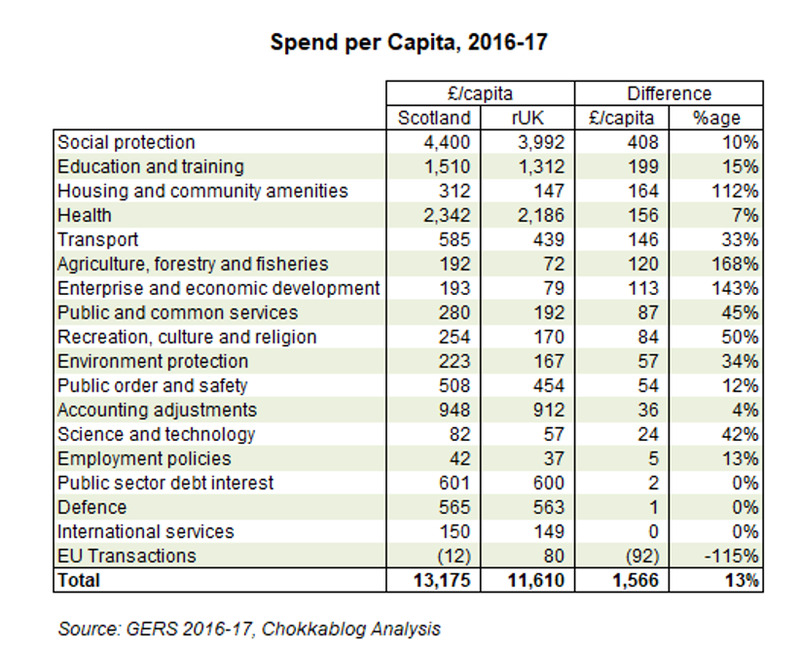 Nobody disputes that more is spent per capita in Scotland then the rest of the UK on social protection, education, housing, health, transport and pretty much every other area of public spending. There isn’t anything inherently unfair about this either; Scotland has geographic, demographic and socio-economic characteristics which mean greater per capita spend is required to deliver equivalent services. So there’s really nothing bemusing or improbable about the relative scale of Scotland’s deficit. Surely only the most desperate politician would lean on rent-a-quote Professor Murphy’s transparently misguided proclamations for support? Which brings us to SNP MP Mhairi Black. Not only did she use a recent newspaper column to cite Professor Murphy as reason to dismiss her own government’s figures but, in an incredible display either of ignorance or dishonesty, she claimed £15bn had been found “missing from Scotland’s oil revenues in the last few years”. The opposite is In fact the case. Scottish Government economists have accepted that their previous Scottish oil revenue assumptions were overly optimistic and have restated historic figures down by £7bn over the last decade. It gets even worse. Ms Black joined SNP MSP Joanna Cherry QC in endorsing the suggestion that low oil revenues are Westminster’s fault for not taxing the North Sea oil industry heavily enough in the last few years. Have they really forgotten that the SNP sought to protect Scottish jobs by calling for tax cuts for the embattled North Sea oil industry, then celebrated those cuts as a victory for their party when they came? A quick couple of observations on the specifics of Professor Richard Murphy's latest foray into the GERS debate. As covered in previous blogs (e.g. here), Murphy is on record as asserting that the GERS figures are “untrustworthy”, “rigged by Westminster”, “literally made up” and “nonsense”. Incredibly in his latest foray (here) he’s even suggested that those using the GERS methodology are “risking the allegation of professional misconduct”. So that includes: the Scottish Government’s Chief Economic Adviser; The Scottish Government economists in St Andrews House; The Office for National Statistics (who judge the methodology to pass the standards required to qualify as National Statistics); presumably also those Nobel Laureats who relied on GERS when they sat on the SNP’s Fiscal Commission Working Group. He's been shown to have made these allegations based on a fundamentally flawed understanding of the facts (e.g. here) and frankly the above should be enough to disqualify Murphy from any civil debate on this subject. But some seem determined to take him seriously, so let's attempt to ignore his previous form and focus on the specifics of his latest contribution (here). The thrust of his latest argument is based on the (widely understood1) fact that money spent for Scotland (allocated to our spend in GERS) isn't always spent in Scotland. Murphy argues that because we don't allocate any of the tax revenue that may be indirectly generated by that spend back to Scotland, there's a flaw in the GERS methodology. He boldly concludes (without any supporting analysis or evidence) that this "flaw" means GERS "is very likely to seriously overstate the Scottish deficit as a result". This blog will explain why he's simply wrong, again. GERS provides historical actual information - it describes what has actually happened under current constitutional arrangements. It's perfectly fine to ask the question "if some of the spend that's allocated to Scotland but not spent here was spent in Scotland, what might the impact on taxes raised be?" - but that's not the job of GERS. For example, the Common Weal White Paper project assumes £50m additional tax revenue would be generated in Scotland as the net result of reducing the defence budget but spending more of it in Scotland, and that £719m of new taxes would come from "relocated government activity". This blog will show why those assumptions aren't realistic, but at this point let's simply observe that this is how this effect is factored in to the independence debate: by modeling alternative scenarios. So to be clear: nobody suggests that the historical actual figures in GERS can or should represent an alternative hypothetical future - that's not what GERS is for. The SNP's own White Paper correctly described GERS as “a useful indication of the relative strength of Scotland’s public finances as part of the UK and a starting point for discussions of Scotland’s fiscal position following independence”. Suggesting GERS is flawed for not showing what would happen if money that isn't spent in Scotland was (and vice versa) rather misses the point of what GERS is. We can embark on a thought experiment here, which shouldn't be mistaken for some kind of tacit acceptance that the GERS report is currently flawed. The GERS figures are precisely what they claim to be, no more and no less. 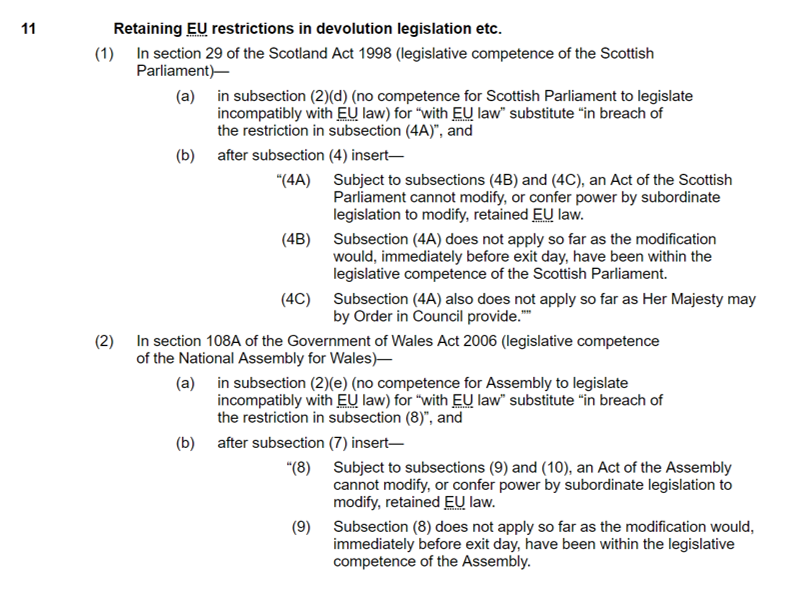 But as a thought experiment, we could consider what would happen if we were to decide to change what GERS shows. We could say that instead of accounting for tax revenues based on where they're raised, when those tax revenues are somehow related to Government expenditure we could try and allocate those revenues on the same basis as the related expenditure has been allocated in GERS. First of all, this would require some heroic assumptions. To illustrate the general point with a specific example. Consider a Scottish pensioner taking a trip to London and spending some of their money in shops on Regent Street. They'll generate VAT in England and contribute revenues to businesses who employ people and pay taxes in England. To follow Murphy's logic we'd need to allocate a proportion of that VAT and other taxes back to Scotland because the money to generate those taxes was a cost to Scotland - if Scotland didn't pay the pension, that money wouldn't get spent in London. The absurdity of this argument is obvious - it's technically correct but it would be impossible to robustly calculate, it's an effect which happens in both directions anyway and - and this is the key point - it's most certainly not material to the figures we're dealing with. 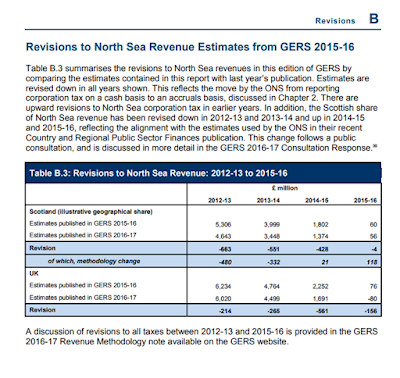 Murphy is on record as suggesting that using statistically significant sample data to attribute some of the revenue lines in GERS (such as VAT, presented in GERS with explicit confidence intervals) makes the report "nonsense". What would he call figures which made finger-in-the-air fiscal multiplier assumptions and had a go at guessing, for example, how much tax was generated from spending in Edinburgh during the festival where the money spent ultimately came from English social welfare spending and so shouldn't be allocated to Scotland? OK so these second and third-order effects are amusingly daft examples, but they serve to illustrate the problems that arise if we head down this path. Let's carry on anyway and focus just on the directly identifiable examples in GERS and assess the materiality of the issue: how much expenditure is attributed to Scotland which generates taxes in rUK and how much is attributed to rUK which generates taxes in Scotland? First we should consider what our materiality threshold should be. What is a significant issue in the context of figures explicitly stated as being accurate (with 95% confidence) to +/-£729m. Does this affect make a jot of difference when we're looking at a deficit of £13.3 billion, a deficit gap with rUK of over £10 billion? I'd suggest we need to be talking about a change of £0.5bn or more and for that change to be systematically in one direction or another to become material in the context of the independence debate. Assuming we ignore the "travelling consumer" argument above and focus on the possibly material issues, this isn't too difficult a scoping exercise. 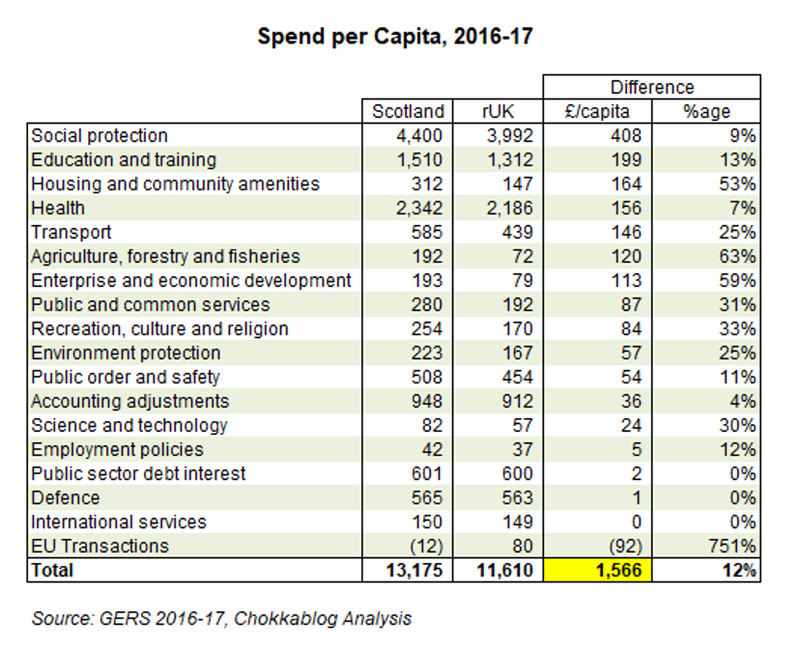 By digging about a bit - as the ever diligent Fraser Whyte has done in this excellent blog - we can find out roughly how much is allocated as spent "for" Scotland and then work out whether materially more or less than that is actually spent "in" Scotland. Let's deal with defence first of all. The MoD provide information on their regional spend breakdown so we can do some quick back-of-the-envelope calculations to scale the difference between UK tax generating spend "on" and "for" Scotland: the figure is likely to be less than £150m3 more allocated to Scotland than spent in. The pro-independence Common Weal White paper suggest a fiscal multiplier of 0.9 for defence spending which I presume they're defining as tax generated/spend made - so to be generous we could argue to transfer £135m of tax from rUK to Scotland in the GERS figures if we follow this methodology. But of course most debates about independence start with an assumption that Scotland would not spend as much on defence as allocated in GERS. The SNP White Paper suggested saving £0.5bn, the current Common Weal "White Paper Project" suggests saving £1.1bn. So the common assumptions used for independence appear to be that we'd actually spend less in Scotland than is currently the case - so our tax revenues would be lower than that currently stated in GERS. Either way we can say with confidence that the fiscal multiplier effect on allocated defence spending is simply not a material issue. So what about the £1.2bn of other? Well we have some proxies we can use to see whether it's likely to be biased in one direction or another. As Fraser points out in his blog on this topic: 12.95% of HMRC employment is based in Scotland and 11.44% of Department of Work and Pensions staff are based in Scotland. So in these cases at least the spend "in" Scotland will likely be greater than the 8.2% of spend currently allocated "for" Scotland. Spend on the BBC will be the other way around: more is allocated to Scotland than spent in Scotland. Nuclear decommissioning costs are an example where Scotland will be favoured by the current methodology because, as Fraser Whyte rightly points out, 15.6% of total UK nuclear decommission spend take place in Scotland but we're only allocated our 8.2% per capita share. We could go on, but I'd suggest there's no evidence of a systematic bias in one direction or another in these other "non-identifiable spend areas" (or if there is, I haven't seen it). 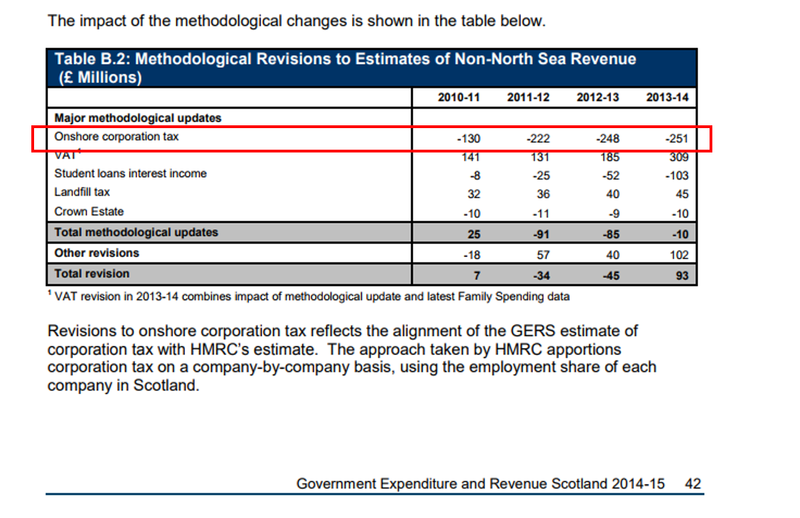 That Common Weal paper assumes a fiscal multiplier of 0.6 for "relocated government activity" producing £719m of "new" revenue. They provide no audit-trail for that figure and I'm not surprised - the quick exercise above shows it's completely nonsensical. I suspect they've assumed a load of allocated cost moving in but no costs moving out, but without an audit-trail we can't be sure. Again: in any debate about independence the question of whether the costs that would replace our share of the UK "scale" functions would be greater or less is a complex one. The White Paper suggested "transitional arrangements" where Scotland would pay rUK for some of these currently centralised administrative functions- so there wouldn't be an immediate shift from "for" to "in" anyway. Enough. Let's remind ourselves that Professor Murphy asserted this issue is "very likely to seriously overstate the Scottish deficit as a result". It's yet another extraordinary and unsubstantiated assertion on his part. Not only has he not demonstrated the materiality of the issue, he hasn't even demonstrated the direction of the impact. Yet again I find myself wondering why he is taken seriously in this debate when he makes headline-grabbing claims like "very likely to seriously overstate" with absolutely no analytically quantified foundation. In fact the simple exercise above is enough to show us that in the context of a £13.3bn deficit (+/-£0.7bn) the issue he highlight is not of material significance. Changing assumptions about how much spending is allocated ‘for‘ Scotland or spent ‘in’ Scotland in GERS will change the net fiscal position. But any revisions are relatively small. I see Professor Richard Murphy has been offering more of his ineffably obtuse observations on the Scottish Government's GERS figures. As sure as night follows day, we can expect to see a logic-mangling column in The National next week and the usual suspects seizing on his musings to proudly proclaim "see: we know nothing!". I'm almost impressed by the lengths Murphy and his cheer-leaders will go to trying to avoid facing the simple truth that the GERS figures reveal. That simple truth is that Scotland's notional independent finances look weaker than the UK's in total because we spend far more per person on comparable services than the average of the rest of the UK. There's other stuff going on of course, but the simple explanation for Scotland's higher deficit per capita - the Deficit Gap between Scotland and the rest of the UK - is that we spend more per person in Scotland on public services. 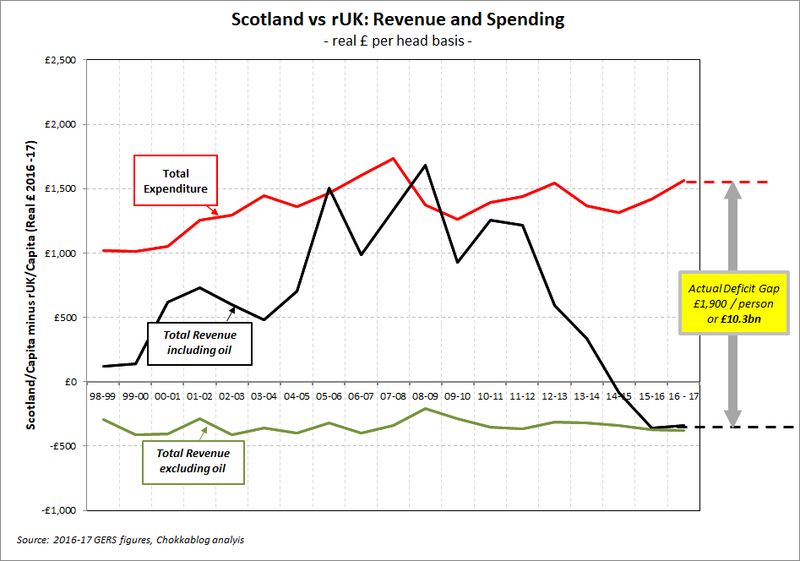 This graph shows Scotland's relative per capita revenue generation and public spending versus the rest of the UK1. The green line shows that Scotland’s onshore economy (i.e. excluding oil) consistently generates about £350/person less than the rest of the UK average. The black line shows what happens when we add Scotland’s volatile oil revenues to the picture. When the black line is above the axis this means Scotland generates more tax per head than the rest of the UK (something used as a proud boast by the SNP during the independence referendum but - as the graph clearly shows - only ever the case because of oil revenues). The red line shows Scotland’s relatively higher public spending, a figure which has risen in recent years to over £1,500/person more than the rest of UK. The Deficit Gap - the very existence of which Prof Murphy tells us bemuses him - is the difference between the red and black lines. This is how much bigger Scotland's deficit per capita is than the rest of the UK's. A small part of the reason is because we generate less revenue, but the vast majority of the reason is that we simply spend more. It's not hard to understand is it? Any even half-competent analyst would look at this data and say "we have to understand why Scotland spends more per capita on public services, that's clearly the main reason why the deficit gap exists". "what GERS still shows is the improbable likelihood that the (sic) Scotland is disproportionately responsible for the UK deficit"
Let me reiterate each of these points. 1. It's not about allocations. As we'll come on to see, Murphy appears to have only just noticed the concept of non-identifiable expenditure (that is "expenditure that cannot be identified as benefiting a particular country or region of the UK but is instead incurred on behalf of the UK as a whole"). 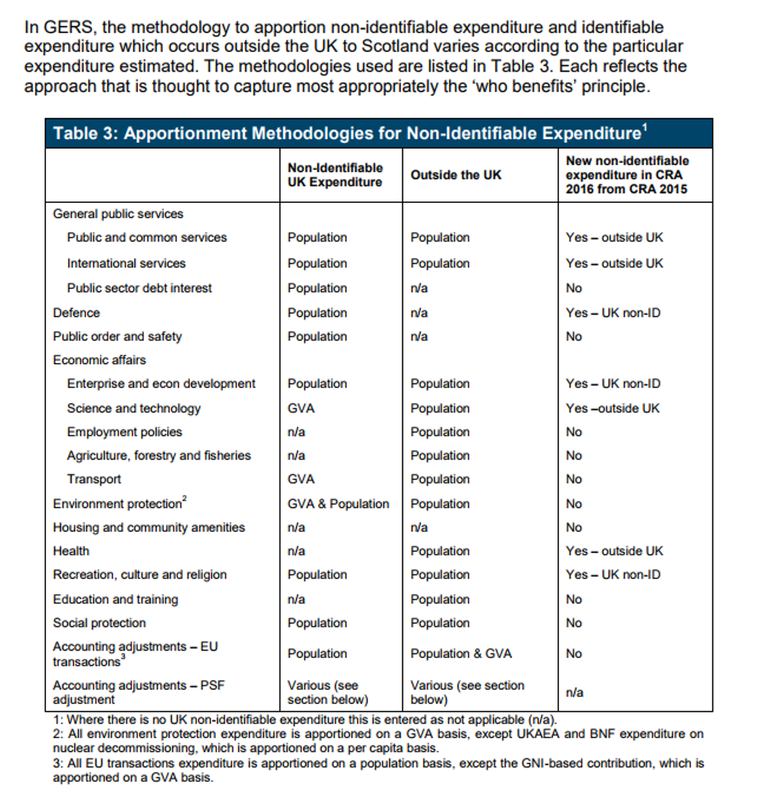 The point here - and I can't emphasise this enough - is that the vast majority (near as dammit all2) non-identifiable expenditure is allocated to Scotland on a population basis. 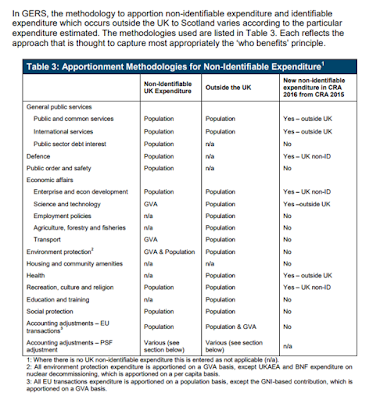 Scotland's spend per capita on these non-identifiable costs (that are allocated on a per capita basis) is, by definition, exactly the same as the per capita spend for the rest of the UK. So when we're looking at per capita spend differences, this has absolutely nothing to do with population-allocated costs. 2. It's known expenditure data. These aren't estimates or survey based allocations (as is sometimes necessarily the case on the revenue side) - when we're looking at the differences in per capita spend we are dealing with known, actual, undisputed data. Maybe it needs laying out more clearly. 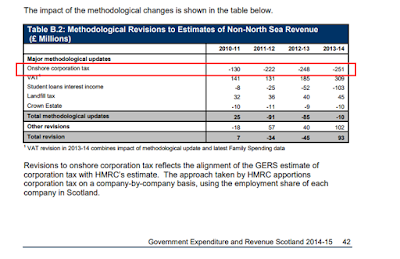 Below is a simple table I've derived from the data provided as support to the latest GERS figures. 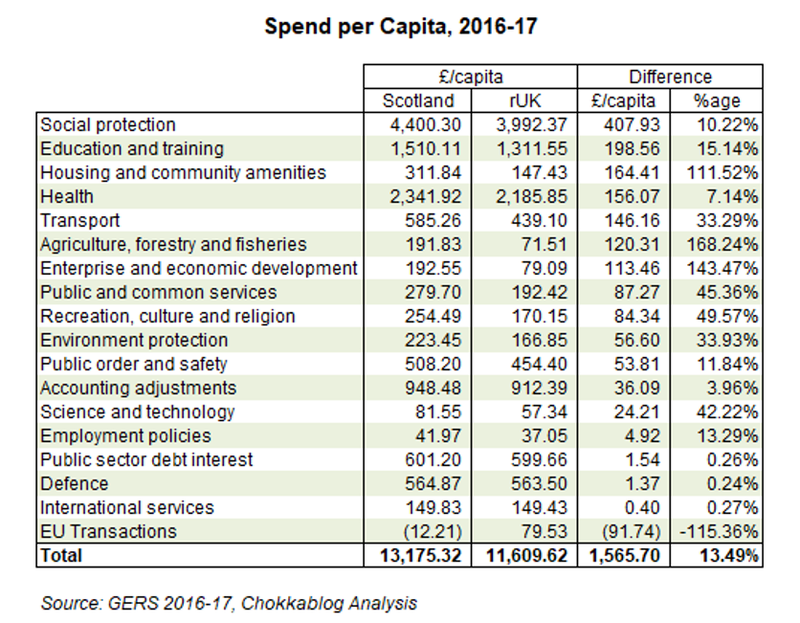 It compares 2016-17 GERS reported spend per capita in Scotland with spend/capita in the rest of the UK. We know that Scotland spends more per head than the UK both because of how much is spent on things like health, education, economic development etc. but also our slightly higher number of people entitled to benefits associated with issues such as long-term ill health etc. There are also some minor technical issues, like the fact that Scottish Water is a public asset in Scotland but not elsewhere. So faced with this frankly rather clear and easy to understand picture, what does Professor Murphy do? Does he start to look at the higher per capita spend areas and understand why we spend more money, whether that is indeed justified by need, whether we could find savings there if we needed to? Like an accident investigator looking at the Titanic disaster and saying "I'm frankly bemused by why that ship sank - I want to hear more about the way the deck-chairs were arranged, I think that might explain it" he disappears off down a rabbit hole questioning accounting treatments he clearly hasn't understood or thought through - don't look at the iceberg folks! "I have been continually bemused by the fact that GERS – Government Expenditure and Revenue Scotland – and its equivalent data for Wales and Northern Ireland – says that Scotland runs a deficit so much larger in proportionate terms than that for the UK as a whole"
"What follows is speculation at present: think of it as an idea put out for peer review right now and not a final argument"
"Until 2013 Scotland collected more per head than the rest of the UK, Now it collects less: this is an obvious reason why the scale of its deficit appears to be growing". 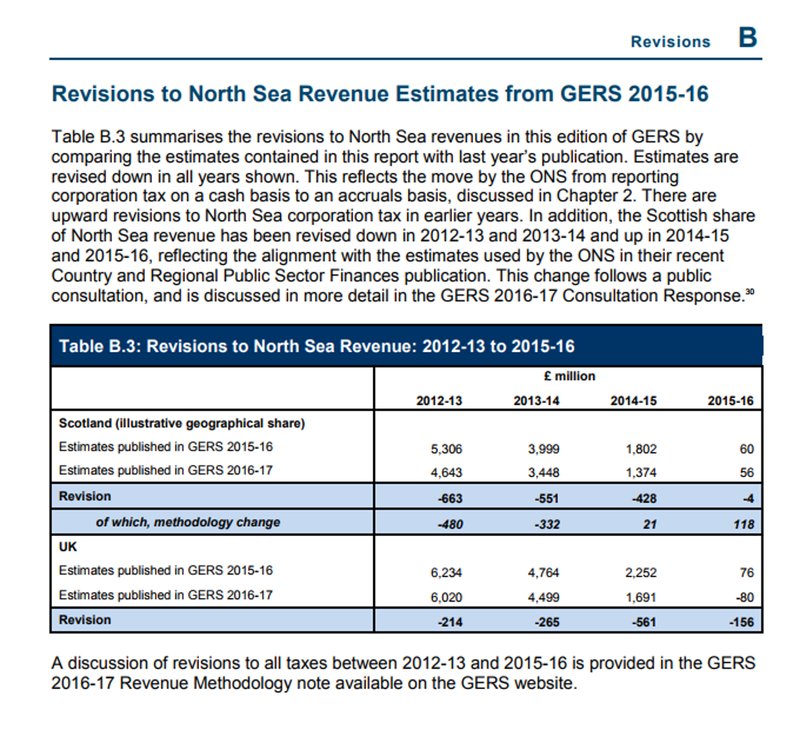 "Much, but not all of my criticism of GERS has focussed on the fact that almost all the significant revenue figures are estimates based on either data extrapolation of the whole of the UK or on relatively small samples for Scotland meaning that I think that there is doubt about whether all the major tax revenues are fairly stated"
This is a side-show to the main-event, but it's worth pausing here. Given Murphy's overall position of being bemused by the deficit gap, I think we can safely say he's implying his doubt about whether the figures are fairly stated suggests he thinks they may be understated. That's certainly how his pro-independence cheer-leaders interpret this proclamation. In fact - as I and many others have argued - any assumption bias that exists is a/ not material to the debate and b/ likely to favour Scotland (because of obvious political pressure to do so). 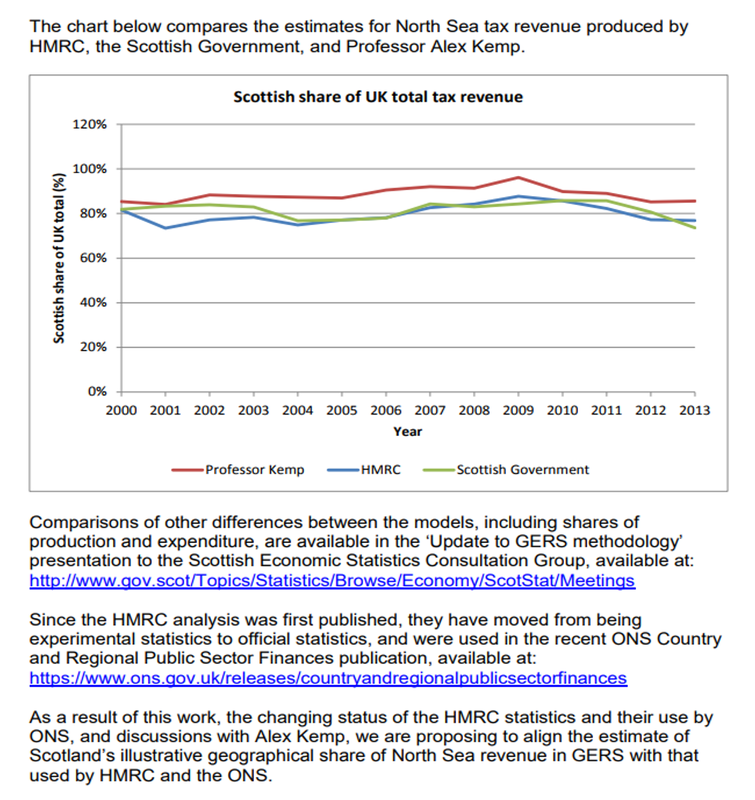 So when the Scottish Government Statisticians chose different assumptions to HMRC for Scotland's share of corporation tax, they were assumptions that were more favourable to Scotland. Similarly when it came to how we calculate Scotland's geographic share of oil revenues, Scottish Government statisticians chose a methodology which favoured Scotland. 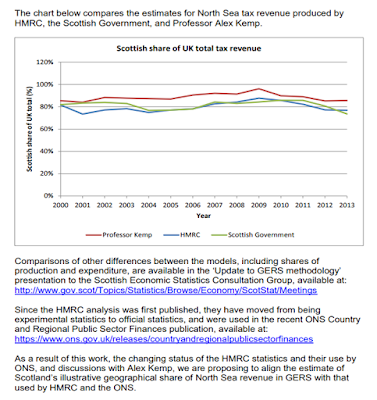 In both cases, following consultation and reflection, the Scottish Government's statisticians have accepted that HMRC assumptions are now more accurate and have revised past figures appropriately3. Since 2007/08, Scotland has run an average net fiscal deficit of £8.3 billion £10.0 billion (5.9 per cent 6.8 percent of GDP). [..] In 2011/12, the latest year for which data is available, Scotland is estimated have run a net fiscal deficit equivalent to 5.0 per cent 7.0 percent of GDP. In the same year the UK is estimated to have had a deficit of 7.9 per cent 7.1 percent of GDP. Since 2007/08 2012/13, Scotland has run an average net fiscal deficit of £8.3 billion £14.0 billion (5.9 per cent 9.0 percent of GDP). [..] In 2011/12 2016-17, the latest year for which data is available, Scotland is estimated have run a net fiscal deficit equivalent to 5.0 per cent 8.3 percent of GDP. In the same year the UK is estimated to have had a deficit of 7.9 per cent 2.4 percent of GDP. The big downward revisions in this year's report are mainly the impact of accepting that the past methodology used for reporting Scotland's geographic share of oil income was overly generous to Scotland (see note 3 for details). As you can clearly see, the net effect of this correction is to adjust down the revenues allocated to Scotland by nearly £7bn over the last 10 years, to adjust the revenues down in each of the last five years. "Some changes, e.g. on oil revenues, have taken place, with modest up-ratings in Scottish revenues as a result"
And we're meant to take this guy's comments seriously? You'd think he'd now actually look to see where and why this is the case, wouldn't you? No such luck. What follows is a painfully convoluted attempt to argue that the accounting approach used in GERS is flawed and that we're unfairly allocated some costs and/or not allocated the tax income associated with those costs because of a failure to appropriately "match" in an accounting sense. This is basically our accident investigator saying "but those deck-chairs: are we sure they weren't rearranged in a such a way that caused uneven weight distribution and thereby contributed to the otherwise inexplicable sinking of the ship?" I have been through what he's written on the accounting technicalities, I really have. Suffice to say there's nothing of material significance in the points he makes and nothing which hasn't been discussed before (albeit in the more esoteric backwaters of the debate, because the issues don't pass any reasonable materiality threshold in the context of the constitutional debate). I could elaborate more, I really could - but I don't see why I should have to spend time explaining why the way the deck-chairs were positioned really doesn't matter - after all: it's Saturday, the sun is almost shining, and I want to go and ride my bike. 1. All the figures I quote here are Scotland versus the rest of the UK (rUK) where rUK = [UK - Scotland]. Some confusion may arise because most commentary you'll read is based on Scotland vs UK (as a whole, including Scotland). 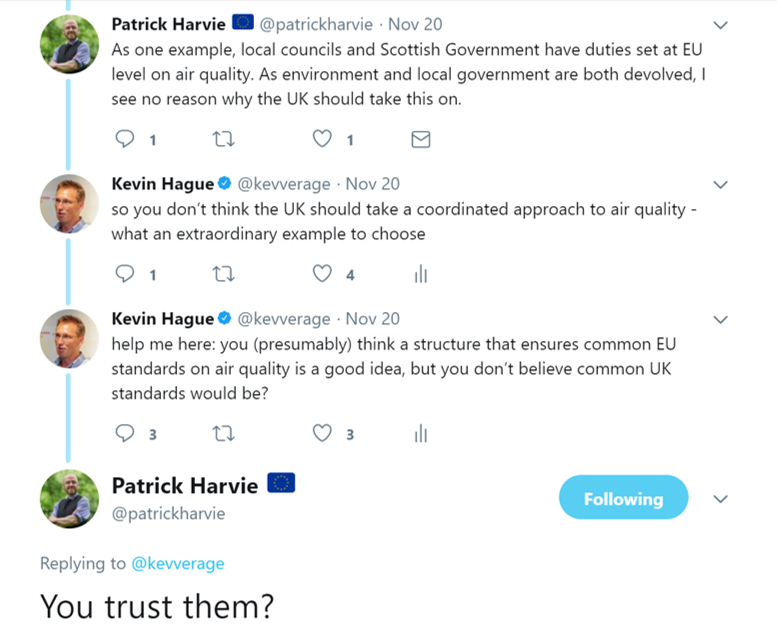 The latter is easier to do (because that's how the GERS report shows the data) and perfectly valid if we're considering our choice to either "share with UK" or "go it alone". I think comparing to rUK is more informative for the ongoing debate about fiscal transfers - if you like it's consistent with the SNP's "us" vs "them" approach as opposed to the indyref question which was "us alone" vs "us with them". To be honest this subtlety doesn't make a jot of a difference to the overall conclusions.